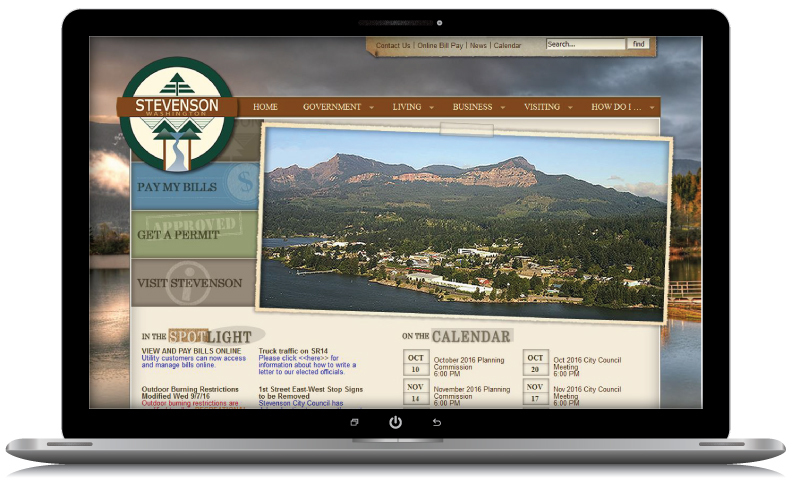 The City of Stevenson is committed to serving the public and providing its citizens and visitors with information in the most accessible way possible. This was an opportunity to create a site from the ground up. WebRock was able to help the staff understand the concepts of web design, and guide them in their decisions regarding content, content relevancy, and placement. The staff relied heavily on WebRock to shepherd the process of creating the site wireframe and page interoperability. The goal and purpose of this project was provide city residents and visitors a resource for day to day needs, as well as links to third party sites related to the city. WebRock also included effective search engine optimization techniques to insure top ranking web search results.